Once again RED have changed things up and this article is now out of date and will no longer be updated. Their lineup now consists of only one body (the 'DSMC2 Brain') and three sensors - the Monstro, Helium and Gemini, all with Weapon specs. More info here. RED have made the Gemini available for purchase to the general public (and not part of a limited run). I will keep the original article below unedited, however with the general release of the camera, more official specs have become apparent. My resolution calculations were correct, though it's now revealed that the camera sports 'dual sensitivities' - with native values at 800 and 3200 ISO for regular and low light applications. The Gemini sensor is housed within an Epic-W body - something that wasn't clear with the limited release. Interestingly though, those first five cameras sport a silver 'Gemini' badge on the front, whereas the general release Gemini have the regular Epic-W badge. The 5K Gemini Epic-W is priced at $24,500; $5,000 more than the first five (Jarred did say it was subsidised) and $5,000 less than the 8K Helium Epic-W.
Jarred made the announcement on his Instagram and currently this post is the only source of information regarding the camera. A custom build for a 'very special customer for use in outer space', it is a new sensor built for low light. Not available to buy online, those who caught the post early enough and had the cash to hand had to email Jarred himself to purchase. Priced at $19,500 however, it certainly seems like a bargain: $10,000 cheaper than an Epic-W and only $7,000 more than a Scarlet-W. This does raise the question however, what DSMC2 body is the Gemini based on? The "Stormtroopers" were Weapon bodies with Helium sensors - the regular black versions of which are currently priced at $49,500. Gemini refers to the sensor, but there's no mention of what body it's in, other than Jarred's cryptic description of it being in a "custom almost-black" DSMC2 body. Suggests that it's a one off and isn't a Scarlet-W, Epic-W or Weapon... and is simply known as a Gemini. The only picture shows a unique silver badge on the front with the Gemini branding - where usually it reads the body model. Interesting to note is the size of the sensor. Reportedly Super 35, in reality it is much larger. RED have always been known for being bigger than everyone else - their Helium 8K and Dragon 6K sensors are both classed as Super 35 though are notably larger than S35 offerings from other manufacturers. The Gemini is in fact more than half way between traditional Academy Super 35 and Full Frame (a x1.22 crop factor). 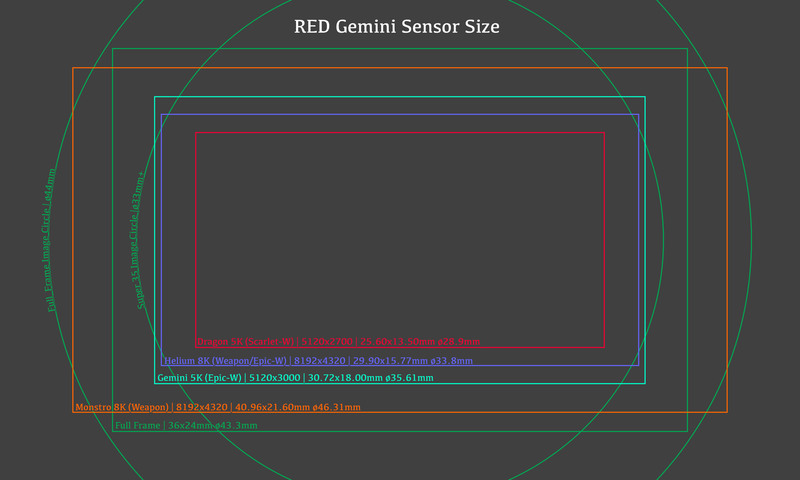 RED Gemini Sensor Size in comparison to the other DSMC2 sensors. Click to enlarge. Also important is that the height of the sensor is tall enough for full 2x anamorphic capture without any cropping - something that until now, was only available in the Arri Alexa family (with 4:3 S35 sensors) and full frame/large format cameras such as the Weapon Monstro and Sony Venice. Academy Super 35 full capture area is 24x18mm - and the Gemini is 30.72x18mm. Whether this is by design - anamorphic in outer space - or not isn't yet clear. In either case, the sensor was clearly designed with large pixels at its foundation. The bigger the pixels, the more light it will capture. Assuming the same 5K resolution as the Scarlet-W (using width only as the sensors have different aspect ratios) and 100% active area, I've worked out the pixel pitch (size) and compared it to other cameras below. Given the Monstro and Dragon's precise pixel pitch down to an exact micrometre (µm), and whilst speculative until more official details emerge, it's a fair assumption that the 5K Gemini is indeed 5120 wide - and from that we can work out the probable height - exactly 3000 pixels high. We can now see that the Gemini sports 20% bigger pixels than the Monstro and Dragon sensors and 64% bigger pixels than the Helium. I've also included the current reigning low light king, the Sony A7Sii for comparison: it's massive 8.4µm pixels are the reason it is so popular for low light applications. If RED were to make a camera with the same pixel pitch as the A7Sii, a Vista Vision sized sensor would have a resolution of 4878x2572. If a Vista Vision sensor was DCI 4K, it would have whopping 10µm pixels! The Gemini also has the same size pixel as another popular low-light camera, the Canon C300ii, and equally interesting is that a 4K (4096x2160) window of the Gemini sensor would be 24.58x12.96mm - nearly exactly the same size as traditional Super 35 cameras like the C300ii (judging by the resolution and dimensions, the Canon has inactive areas at the top and bottom of the sensor for DCI capture). Whist 'native ISO' isn't easily quantifiable with RED's sensors, two stops more sensitive than the Helium sensor would rate the Gemini somewhere in the region of 5,000-10,000 ISO (RED guru Phil Holland rates the Helium with the Standard and Low Light OLPFs between 1280 and 2500 ISO). Mighty impressive - one can only imagine what it will be like pushing beyond that and with post-processing (noise reduction etc). How will it compared to the Sony A7Sii? We'll just have to wait and see once the five lucky owners get their hands on it. Whether the Gemini is noisier at ultra-high ISOs or not, the higher data rate and raw capture is sure to provide a much more robust image than the Sony's lossy 8-bit codec, meaning richer blacks and more detail overall.